When I was invited to be a part of the swim team at UMBC, I never would have thought I would be able to accomplish so much. The coaching staff and my teammates have helped me do more than I ever dreamed I could have over the last four years. 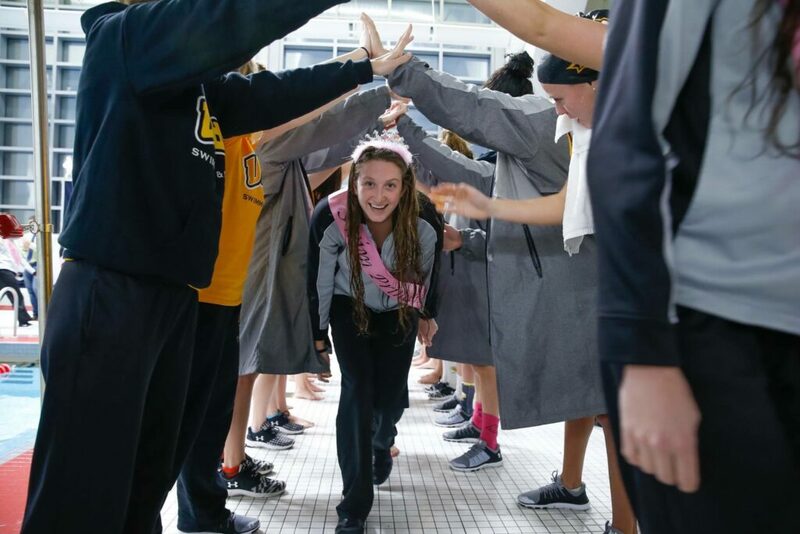 With six school records, six America East gold medals, and an NCAA championship bronze medal to her name, Emily Escobedo is graduating from UMBC as one of the most decorated swimmers in university history. Escobedo participated in NCAA championships for all four of her undergraduate years, and in her senior year has been named an NCAA All-American. She was the America East Rookie of the Year as a freshman, and has since been named the conference’s Swimmer of the Year four times. This past summer, she was selected to participate in the 2016 U.S. Olympic Trials, placing 10th in the 200-meter breaststroke. While winning medals in the pool, Escobedo has also excelled academically, making the America East Honor Roll for 2013-14, the America East All-Academic Team in 2014-15, and earning America East All-Academic Honors for 2015-16. She credits her coaches with pushing her to succeed both athletically and academically, and her teammates for their support. Emily Escobedo walks under a bridge made by her teammates at the America East conference finals earlier this year; photo courtesy of Escobedo. Escobedo particularly enjoyed studying psychology and early childhood education at UMBC, and a student teaching placement at the Marley Glen Special School cemented her interest in special education as a career. After graduation, she will work at a camp for children with disabilities before returning to UMBC to finish her early childhood education certificate in the fall. Following the certificate, she will begin a graduate degree program in special education.